Starting in 2014, after students complete their third and final semester of the Education Program, they participate in a shorter (August to December) intensive program that combines aspects of the Education Program and the Extension Program. The call for submissions for this program is open to the public and the twenty participants are chosen by a jury, with priority given to the school’s own graduates. 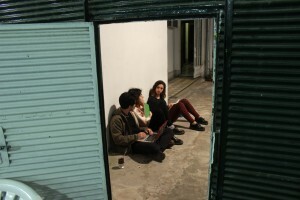 Applicants, who must be between the ages of 18 and 25, residents of the city of Buenos Aires, and have some prior artistic education, submit some personal background information along with a project proposal. The sessions are held three times per week and include: studio days at the Studio under the supervision of a renowned contempory Argentine artist; open studio time; classroom sessions, and visits to museums, galleries, and other spaces with special guest speakers. The program incorporates the use of the spaces and tools of Casa Escuela during the open studio time. Some communal materials are provided (paper, magazines, easels, camera, projectors, etc) but the personal supplies must be provided by the individual students, and can be kept at their personal lockers. At the conclusion of the semester, a one day exhibition is organized, during which the young artists exhibit their works to the public.